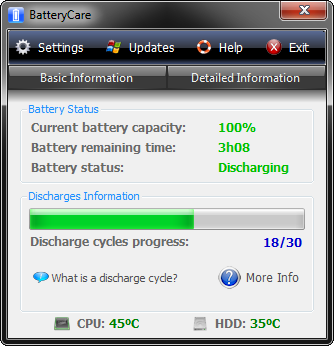 BatteryCare is a small freeware that helps users to easily optimize the usage and performance of the modern laptop's battery. 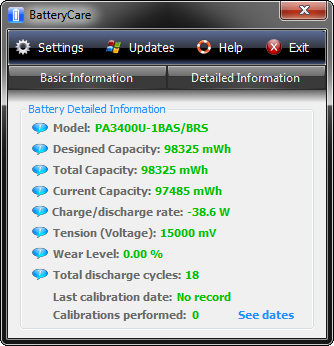 It shows all the details information of your laptop battery like such as wear level, capacities, consumption, manufacturer and more. And also this tool shows your CPU and hard drive temperature either in degrees Celsius or Fahrenheit. When running on the batteries it automatically disable the graphics accelerated theme in Windows Vista and specific services which is degrade battery life time. Once the laptop stops running on batteries, the theme is re-enabled and the stopped services are restored. And the new version includes notification feature, shows pop up notifications like temperatures, charge status, remaining times and power plans. The software automatically updates when new version available.